Another weekend, another afternoon tea! 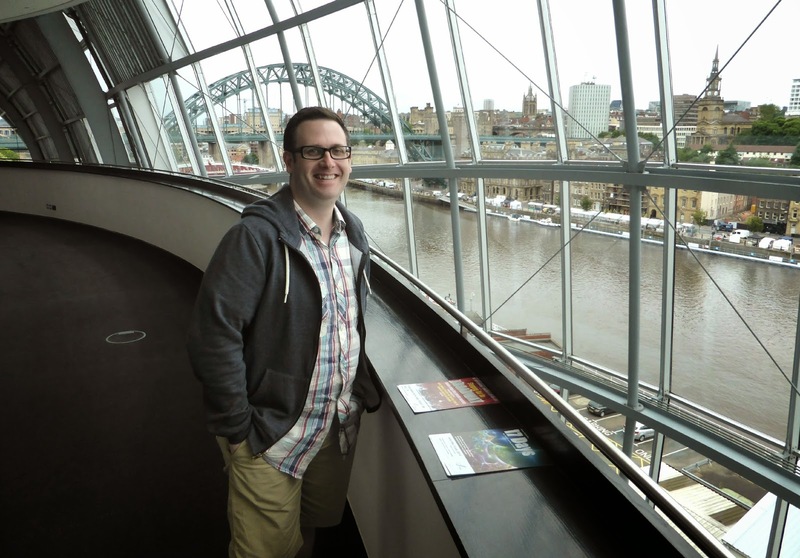 This time at the Sage in Gateshead. The Sage sits on the banks of the Tyne, with its stunning sloping glass roof it's an instantly recognisable feature of the Quayside. It's best known as being a music venue that caters for all tastes - hosting concerts by world famous pop artists, jazz musicians and folk singers as well as being a centre for the teaching of music and singing and hosting jazz, folk and classical festivals. It's an exceptional place to sit and chill out. I often find myself a nice comfy seat and settle down to some people watching. It's a very inspiring, fun environment to be in and is always full of happy chatter and talented people making gorgeous music. 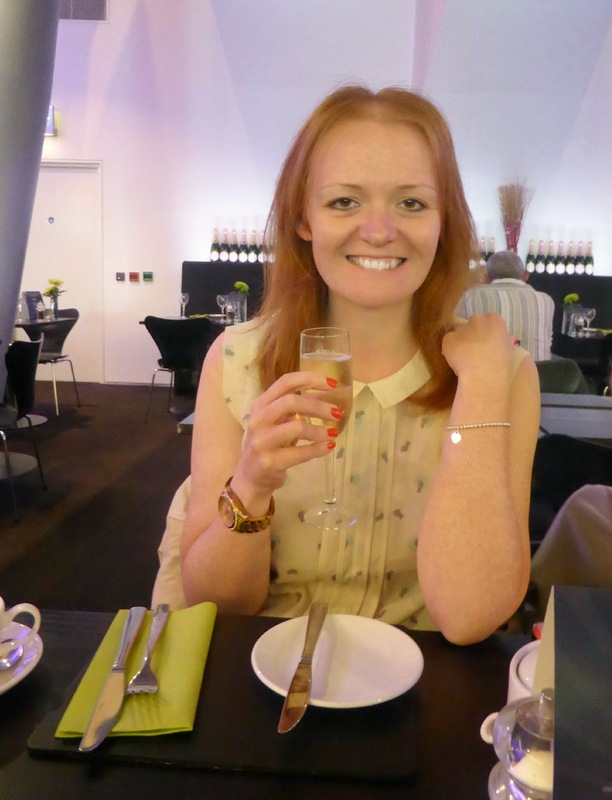 Despite having spent many hours sitting in the Sage enjoying my surroundings, I'd never been to the Brasserie for food so as soon as I saw a leaflet advertising their afternoon tea I knew it was time I booked a table. 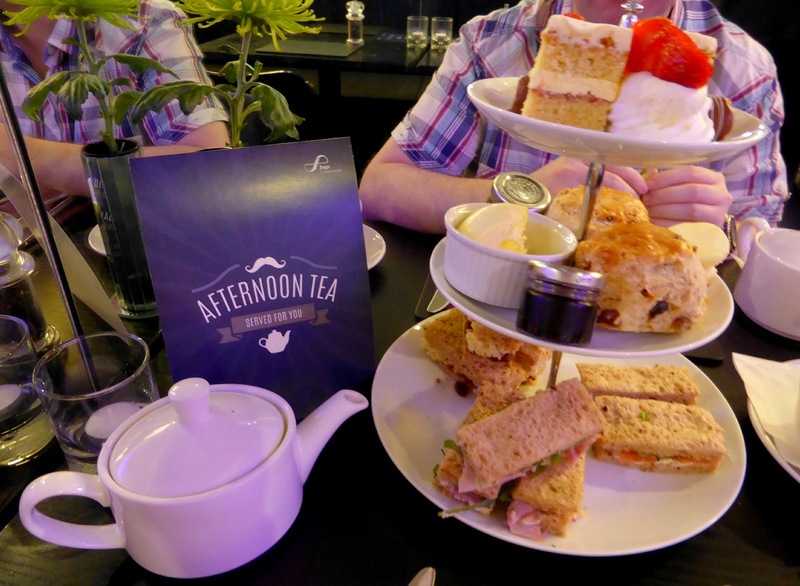 I was really happy when we arrived and a pianist was playing some tunes from the musicals, afternoon tea with live music is my absolute favourite thing but it's not something you can find too often in the North East. I love the dramatics of sipping on a cuppa whilst singing along to "Music of the Night". The Brasserie is tucked away in a corner of the Sage, which unfortunately makes it a rather dark place to eat in comparison to the rest of the building which is bathed in beautiful light from the glass ceiling. Whilst having afternoon tea in a dark room isn't ideal I should imagine it's a really lovely place to eat an evening meal as it's so cosy and intimate. Our table was next to a huge mirror which amused us, it felt a bit like Simon and Chloe were on a double date with Mirror Simon and Mirror Chloe (yes we are very silly). 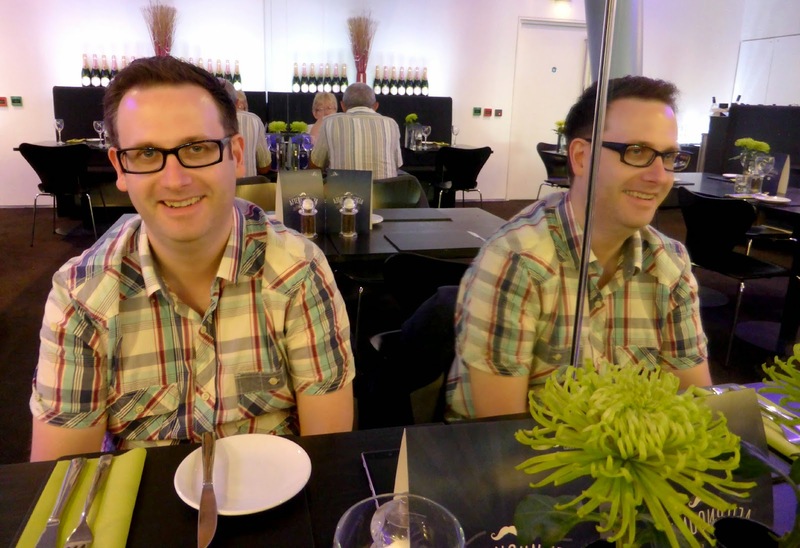 Before I carry on, can we take a moment to appreciate Simon's (and Mirror Simon's) new glasses? I love them! 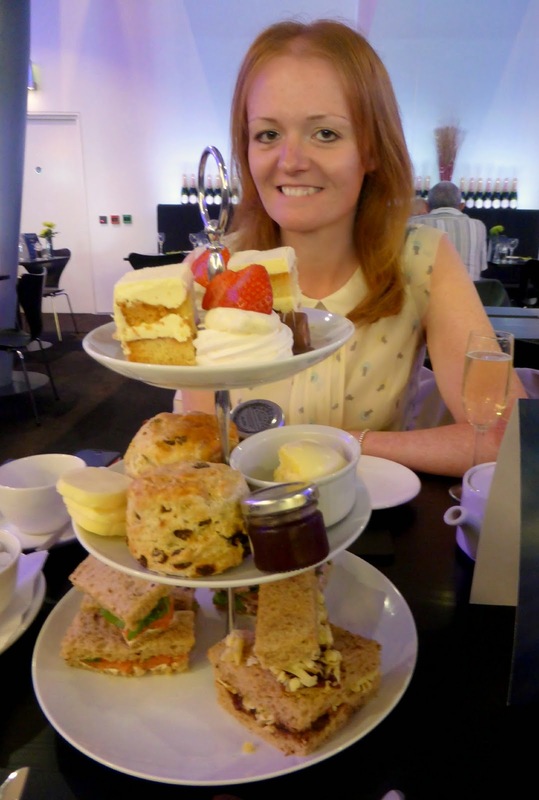 The Sage offers three afternoon teas. Firstly the Gentlemen's Afternoon Tea which is a wonderful alternative to the usual spread with food including scotch egg, pork pie, bread and dripping along with the usual sandwiches and cakes. Secondly there's the Dudes & Dolls' Afternoon Tea, a tea specifically for the kids with a mini cake selection, scone and jam served with a milkshake (for a moment I considered saying I was under 18 just to get my hands on the milkshake ... to humour me let's just all pretend that I could have got away with that). We went for the third option, the Traditional Afternoon Tea which was £15.95 and I had a cheeky glass of Prosecco for an additional £4.00. Prosecco is something that I've recently started getting into (probably since attending blogging events), it's a great drink to mingle with, a welcome addition to lunch and I'm now loving it as an accompaniment to my afternoon tea sandwiches, leaving me with the pot of tea for my scones and cakes. I can see this becoming my thing! There was a lovely selection of sandwiches on a list that we had to pick from. This did mean that we had to pick three fillings (so make sure you go with someone you can agree with!) 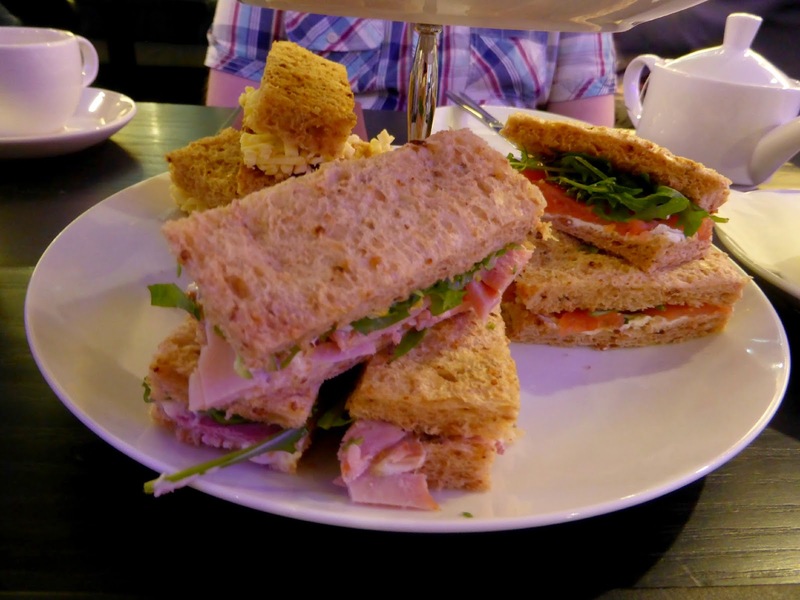 After a small debate we settled on Northumberland cheese which came filled with a delicious green onion and grape chutney, honey glazed ham, mustard mayo and salad which was literally the nicest ham sandwich I've ever had and smoked salmon, cream cheese and rocket. We were equally impressed with the scones, which were described on the menu as "mini" but were anything but. We got one fruit scone each and it was huge and perfectly formed. 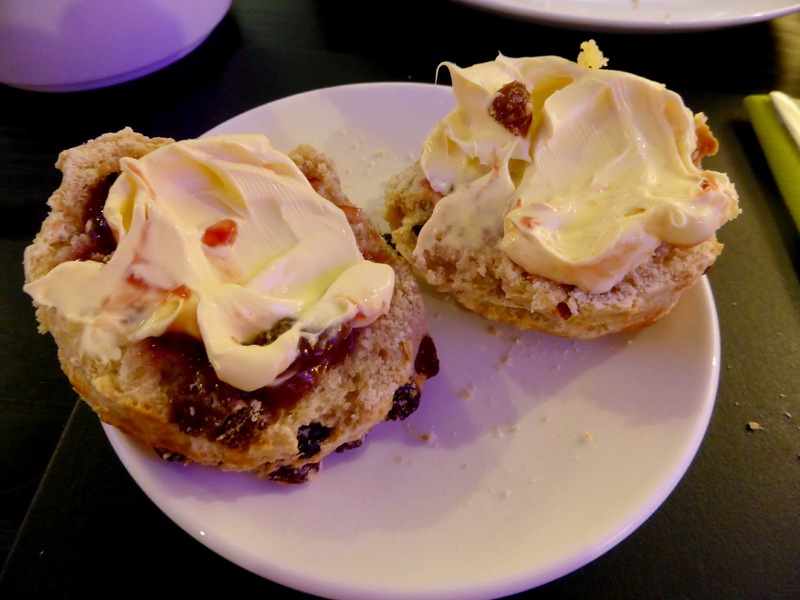 It came with our favourite little jars of Tiptree jam and a huge pot of cream which I absolutely slathered all over my scone - I might have overdone it? The top tier gave us three miniature cakes each, a little square of Victoria sponge, meringue and strawberries and a chocolate roll filled with coconut. They were all really lovely, and a perfect bite size. I think if the cakes had been any larger we would have really struggled to finish. We were so full when we finished but managed to struggle our way up the stairs to a higher level of the Sage to take a look at the beautiful views of the Bridges from the glass roof before we began the very hard and slow walk back home. Looks like we have yet another fantastic afternoon tea in the North East to add to our ever growing list. Ooh this looks lovely! The food looks amazing :D The gentlemen's one is such a good idea! I want to visit the Sage it looks like such a great building! You and your afternoon teas ;) This looks great and I especially like the idea of tea refills - afternoon tea is just as much about the drinks as it is about the food! I've only ever been to afternoon tea once, for my 21st at the Ritz (worried nothing will ever top that!) so i really think I need to go again. It's a shame this one is so far away! Lovely post as usual - and I laughed at the mirror date comment :) Definitely something I'd say too! I'm getting myself such an afternoon tea reputation now! I haven't actually been to the Ritz so I'm very jealous, it's so so expensive though so definitely one for a very special occasion. You should definitely give it a go, there'll be no looking back! We must have just missed each other, I was at the Sage about 20 minutes before you that day! I definitely should have hung around and stole a piece of cake. 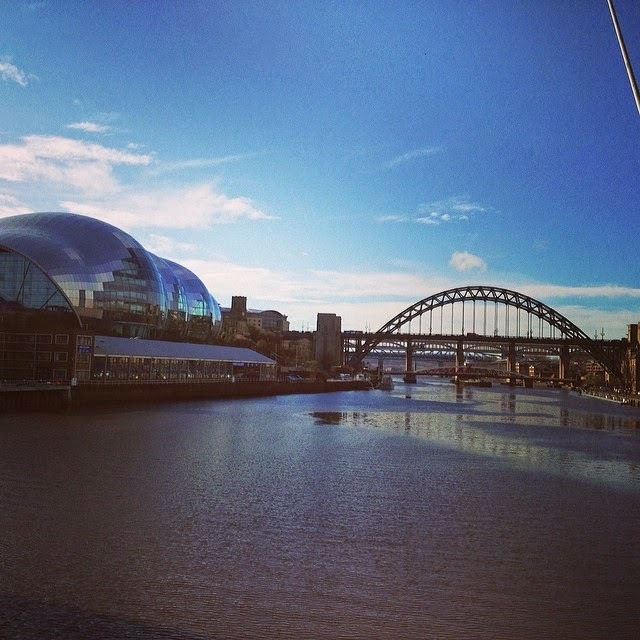 What a view from the Sage, eh?! And yes, Simon's glasses are very smart! I've yet to even go to the Sage! Haha, I'm so excited for you to share some new places for cake on Sunday mind! I have great expectations! No pressure eh?! I hope I can find somewhere good! Wow if those scones were described as mini i'd love to see their regular ones, they look huge and yummy! Always loved having a wander to the Sage, the views from there are amazing. I think it'd be fine, there were loads of kids there when we went and it did seem very child friendly, I'm sure if you tell them about the pushchair in advance there'll be no problem at all. I often pop to the Sage in my lunch hour and a lot of Mums and Babies seem to meet there for a catch up, there are always so many prams there. It was definitely a great value for money one!